Bobby Gene Ralph was born on July 9, 1929, in rural Hardin County, Illinois, the son of Frank and Lena (Robinson) Ralph. He passed from this earth on April 3, 2019. Bobby was preceded in death by his parents, his wife, Martha Faye Ralph, two brothers and four sisters. He is survived by his seven children: Judy (Tom) Lloyd, Mooresville, IN; Connie (Ron) Potts, Parkersburg, WV; Roger (LaDonna) Ralph, Greenwood, IN; Melinda (Daniel) Holtzclaw, Jackson, TN; Lena (Robert) Mayer, Harrisburg, IL; Barbara (James) Weber, Hilliard, OH; and Martha Drake, Portage, IN. Bobby is also survived by 17 grandchildren and 13 great-grandchildren. He was employed for 45 years at Inland Steel Company in Gary, IN and lived in Portage, IN for 60 years. He was a Shriner and a member of the Masonic Lodge for over 60 years. 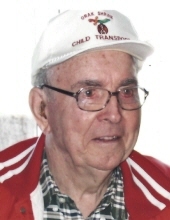 He served on the Shriner Child Transport Unit, taking children for treatment to the Shriner Hospital in Chicago for many years following his retirement. G.H. Herrmann Funeral Home of Greenwood, IN is handling visitation arrangements in Indiana. Aly Funeral Home of Eddyville, IL will handle the funeral service at the Ralph home place near the Old Iron Furnace with burial in Rose Cemetery. To send flowers or a remembrance gift to the family of Bobby Gene Ralph, please visit our Tribute Store. "Email Address" would like to share the life celebration of Bobby Gene Ralph. Click on the "link" to go to share a favorite memory or leave a condolence message for the family.